The Penilated Dildomorph is a relative of the microscopic Water Bear (Tardigrade) and is responsible for ending the widespread use of the latter creature in amateur science projects. No teacher wanted to be showing a class of high school kids a Water Bear only to have a Penilated Dildomorph come swimming right up under the lens of the microscope, but it happened all too often, and the effects on classroom discipline were disastrous. 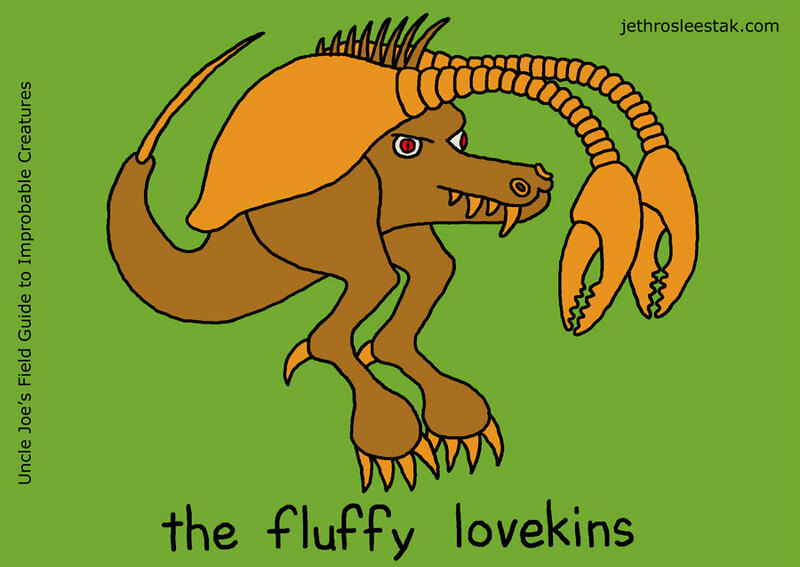 Fluffy Lovekins is the ironic name for the Eye-Stabbing Murderbeast, which is a training organism used by the US Marine Corps’s elite GMO Response Unit. The original Fluffly Lovekins was a child-sized animatronic teddy bear with pink fur and an annoying-as-hell cutesy voice that gave adults migraine headaches. This teddy bear was the most popular toy of the 2037 Christmas season, and Amazon-Walmart shipped over 10 million units in North America alone. 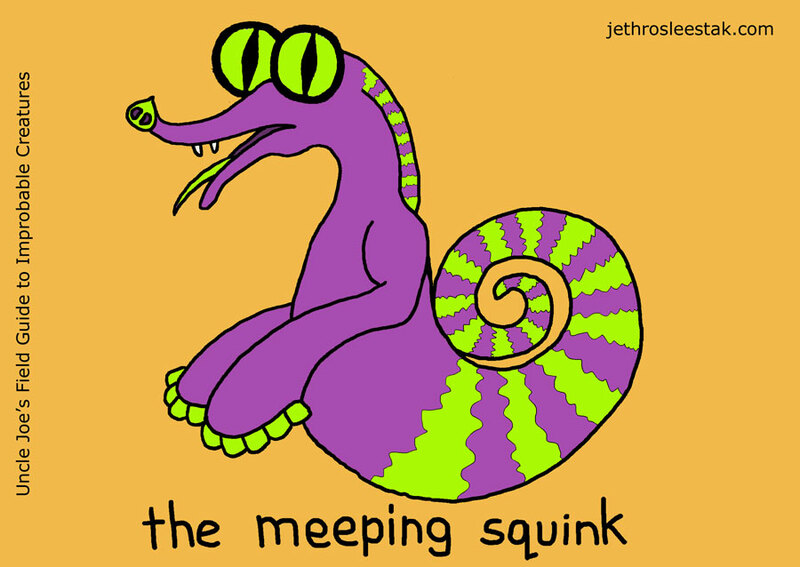 Part seahorse, part mudpuppy, part mole, the Meeping Squink was genetically engineered to burrow into clogged residential sewer lines. This creature was highly effective for its intended purpose, but escaped specimens established wild populations in municipal sewer systems, and now these “Sirens of the Sewers” are responsible for at least 15% of all heart attacks in North America. 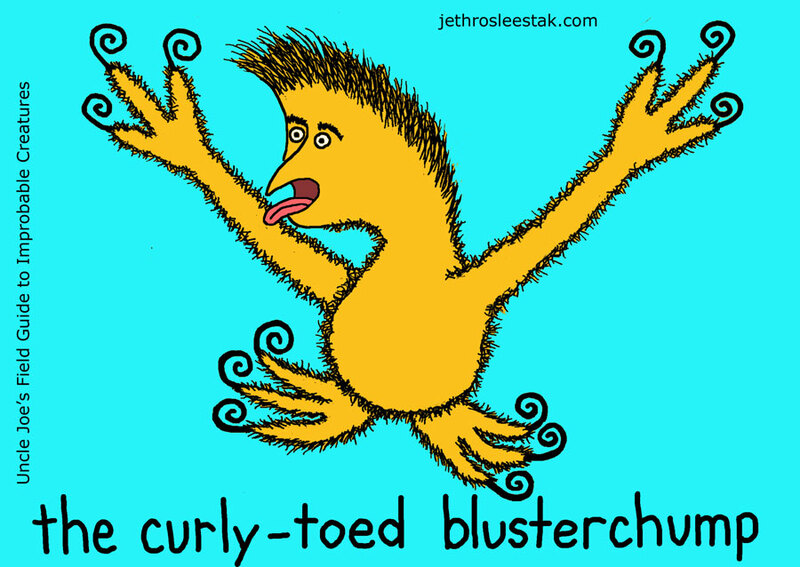 The Curly-Toed Blusterchump is a tiny creature that was genetically engineered to live inside the ear canals of dysfunctional people of a certain personality type. The Blusterchump’s intended hosts are those people who are always auditioning to play the panicky idiot in the disaster movie, those people whose lack of emotional control is matched by an inability to deal with the unexpected. 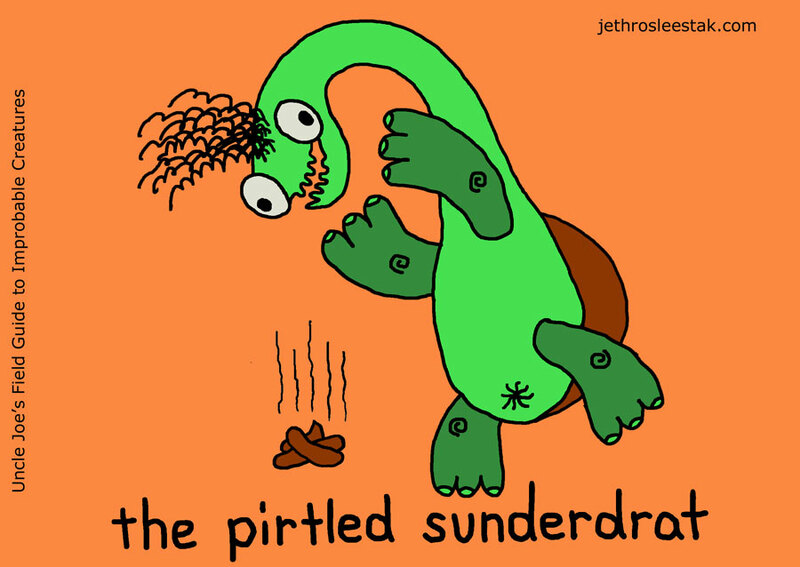 The Pirtled Sunderdrat was genetically engineered to be a companion pet for lonely artists and writers, and thus these creatures were given creative impulses and manic-depressive tendencies so that they could relate to their owners. 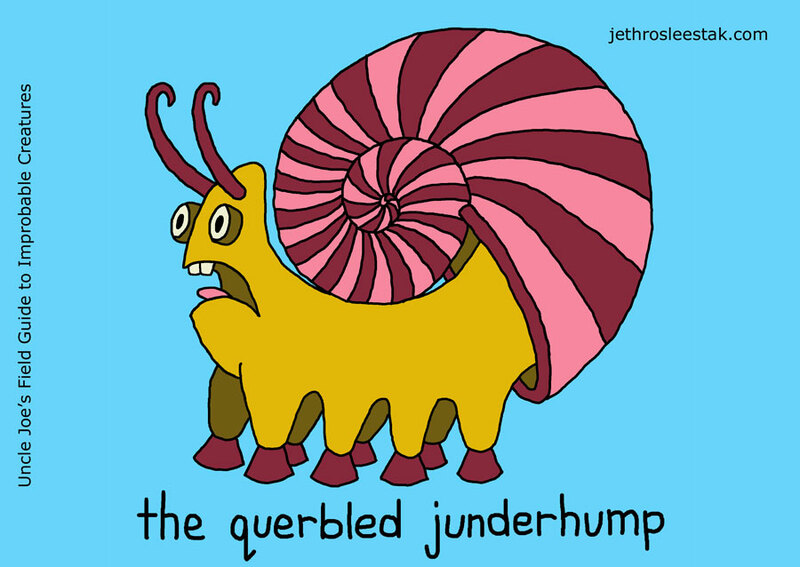 The problem is that the genetic engineers overdid it a little bit, and the Sunderdrat is continually enchanted then disgusted with everything it makes. 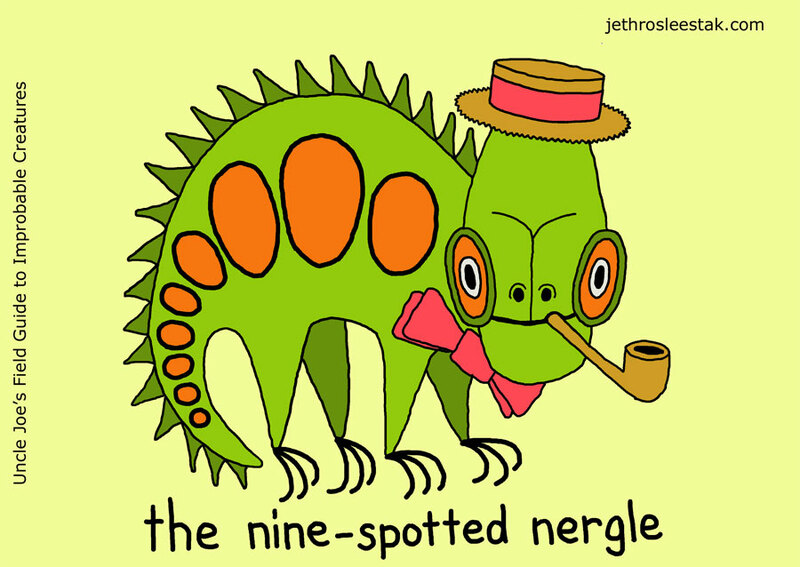 The Nine-Spotted Nergle are sapient lizards that ride on people’s shoulders and explain to them what blockheads they are being.